The displayed fares were last found on: Wed | 17 April 01:39 AM(EST) . Fares are round trip. The above table details cheap flights to Maracaibo Venezuela based on historical data. These are all inclusive airfares containing base fare, fuel surcharges, and taxes imposed by airlines and our service fee. To know the current fares, use the flight comparison engine available on the top. Search, compare and book cheap Maracaibo flight tickets with Cheapfaremart, an ASTA (American Society of Travel Agents)-certified travel agency. We help you customize your flight travel plan with options – one-way, round-trip, nonstop, one-stop, two-stop, etc. You also have the options to filter out best airfare deals to Maracaibo based on Economy, Premium Economy, Business or First class. Read the difference between business and first class flight. Maracaibo is called “La Primera Ciudad de Venezuela,” which means (The Most Important Venezuelan City). And the credit goes to the state and regulators who contribute to its development. 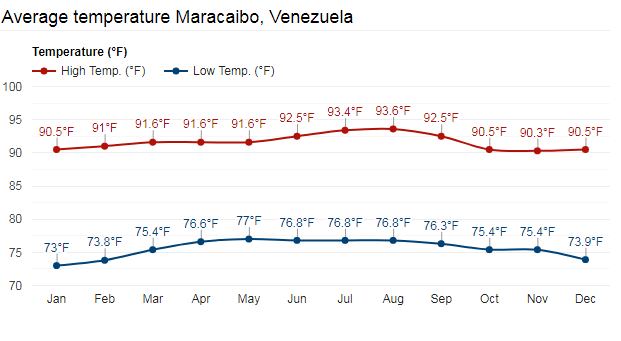 What is the Best Time to Visit Maracaibo? 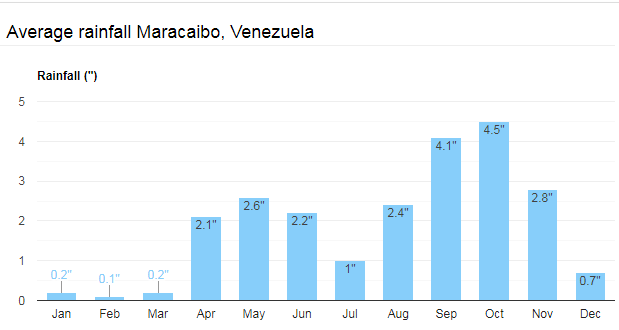 The best times to visit Maracaibo are between November and December (autumn) and between March and April (spring). Temperature stays consistent throughout the year. So, temperature doesn’t bring any significant change to the flow of tourists. What makes the difference is the rain. The rainy season starts from April and lasts till November. September and October are the months of torrential downpour. December to March is the peak time of tourism. The high tourist influx triggers the airfare and hotel rentals. If this is your family vacation and you want your kids to enjoy it the most, add Vereda del Lago to your things to do list. This is an excellent combination of park, lake, and garden spread over 25,000-square-metre. The eco complex is home to facilities including swimming pools for infants, children, and adults; tents; parasols; eating facilities, and gift shops. Kids love to play with the interactive games centered on the culture of the Caribbean, nine slides for younger children, a collection of small fountains. Aguamania has two body-slides and two raft-slides. So, expect an excellent time to spend together. Jog, picnic, play with the kids and enjoy the beautiful landscape. The cable-stayed bridge connecting Maracaibo with the rest of the country is a significant tourist spot. It spans 8,678 meters (5.392 mi) from shore to shore. The entire length has got five segments each measuring 235 meters (771 ft) long. The bridge is supported from the bottom by 92-metre (302 ft) tall towers. This church is a signature of neoclassicism. If you are traveling during November, you could have an opportunity to attend the feast day, which falls on November 18, with thousands of devotees. If you are looking for some unforgettable beach activities, head to Cayo De Agua, Madrisqui, Cayo Sombrero, Noronky Beach, Mochima National Park, or Playa El Yaque. Enjoy turquoise water, white sand, and tranquility and play with dolphins and other water inhabitants. Simón Bolívar International Airport (CSS) and La Chinita International Airport (MAR) connect most of the US cities with Maracaibo Venezuela. Top airlines rendering their flight services include Aruba Airlines and American Airlines. You may find nonstop as well as connecting flights between the two cities. How Much Does a Flight to Maracaibo Cost? Airfare expenses take away a major chunk of your vacation planning. For your reference, we have mentioned the cost of round trip flight to Maracaibo. However, airfares are updated dynamically based on availability and demand. Perform a fresh flight search to know the current fares. If you are flexible with your dates, we can help you with the cheapest Maracaibo flight. Opt for our Flexible Date Fare option. Why Book Airline Tickets to Maracaibo with Cheapfaremart? Hope you found this Maracaibo travel guide useful in planning your vacation. For help regarding finding the best flight routes and reserve your flight, call us on 1-844-869-5222 (Toll-Free).